Accessories. How to accessorize your kilt? This page deals with the process from having received your tartan kilt and some accessories till you are out and about in your kilt. A kilt is indeed something very different compared to trousers; the way it looks and how it does feel, wearing it. Let’s assume you have just unpacked your kilt, sporran, belt & buckle and kilt hose. How to handle the stuff? 1. Start with the upper part of your body. You need a shirt of some kind, a collar, a polo or a t-shirt. I myself will for pure aesthetic reasons always wear SOLID coloured shirts with tartan kilts. To me it is also important that the colour of my shirt is matching the colours of my kilt. Not necessarily the same colours, but in harmony with them. A shirt should always be tucked in when wearing a kilt. That is what most kilt wearers think. Well, having always shared this opinion I must admit, that changes in men’s fashion over the last few years have made me think that for casual wear a polo- or T-shirt might be worn untucked. 2. Put on your kilt hose. They are by nature over-knees. When choosing socks you should always pay attention to your overall colour scheme. 3. Fasten your garters - with or without the flashes mounted - 2-3 cm (approx. 1 inch) under your knee cap. How to position the flashes? I have seen several suggestions on the internet. “9-15” o’clock should be OK, but better “10-14 o’clock”, meaning the flashes pointing slightly forward on the legs. Fold the socks over them. Check that the garters are covered by the socks. 4. Put on your shoes. Yes, it is easier to get your shoes on before the kilt. They should preferably match the colours of other leather items you might wear (sporran and belt). Or, if sneakers, the tartan. Most common - and probably therefore cheaper - are black kilt belts and sporrans, rather than brown ones. Then black shoes are called for. 5. Now the kilt. Put it around you. The pleats shall be at the rear of course. With your right hand you are now holding what is to be the under-apron. Now fasten the strap to the buckle over your left hip, after you have led it through the little slid next to the buckle. Then fasten the over- apron. For that you have one or two buckles above (or at) your right hip. 6. Adjust the kilt horizontally. As an indicator hold your thumbs on the belt straps at the back. 7. The buckles and straps will prevent your kilt from disgracing you, But on to the belt. It does not have to go through the belt loops. In fact they are no belt loops but meant for your sporran strap! But being wide enough; why not use them for the belt, too? I always will. Some will say sporran first, then belt. It’s a bad idea. You need to be able to slide your sporran to the side. It is difficult or impossible or at least inconvenient if the sporran strap is covered by the belt. 8. The sporran shall hang on your front. But don’t have it hang too low. About 7-10 cm (3-4 inch) or a hand’s width below your belt should be appropriate. (If your kilt is a jeans waist model the sporran might hang too low and you might consider ditching it). 9. Take a look into a mirror. Should your kilt be lowered or heightened a little bit? Is it centered correctly? Make some adjustments if necessary. 10. You are ready to leave! Complicated, you think? It is not. When you have been wearing the kilt for a week or so, you’ll find that it is faster to get into a kilt than into jeans. And it is. The kilt is one of my first kilts, a cheap four yard PV kilt, a budget kilt, which such kilts were called around 2000. Your first outing you might prefer making a bit far from home, in order that you'll find yourself wearing a kilt and that you can build up self-confidence. Self-confidence is extremely important. Have a plan, like exactly when and where and for how long out in public. And stick to it. Public could be defined as in the open a not too deserted place or in the neighbour city, in streets, in museums, at restaurants, in shops, and in public transportation. Regarding duration, make it hours, not minutes from leaving your car till being back. What else to wear with the kilt? Over a regular shirt you may also wear a sweater. It should be untucked – and then you should probably not wear the belt. As outer wear on cold days a short wind breaker (bomber jacket) or anorak will do the job efficiently and look nice with your kilt. Short wind breaker. No sporran. Caledonia is a universal or fashion tartan. No clan connotation therefore. Green kilt hose matching the green in the tartan. Wear shoes fitting the purpose. For casual functions sneakers will often do. Heavy-duty shoes and walking boots are also popular. Must I wear kilt socks when temperatures are high? According to the purists, YES. You COULD PERHAPS scrunch your socks down. 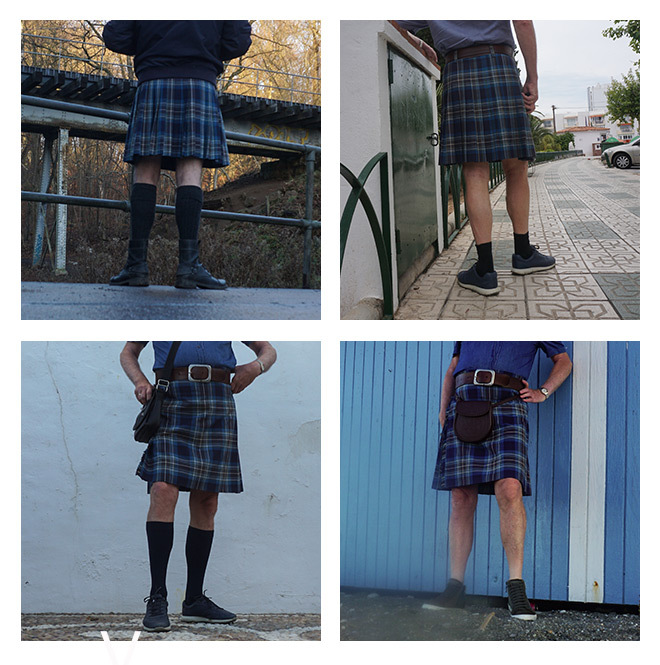 On a hot day I think, however, that short socks or no socks or “invisible” socks are making a lot more sense than thick woolen kilt hose, provided the kilt is worn as casual wear and not to a wedding where a dress code must be followed. Can I wear tights or leggings on a cold day? 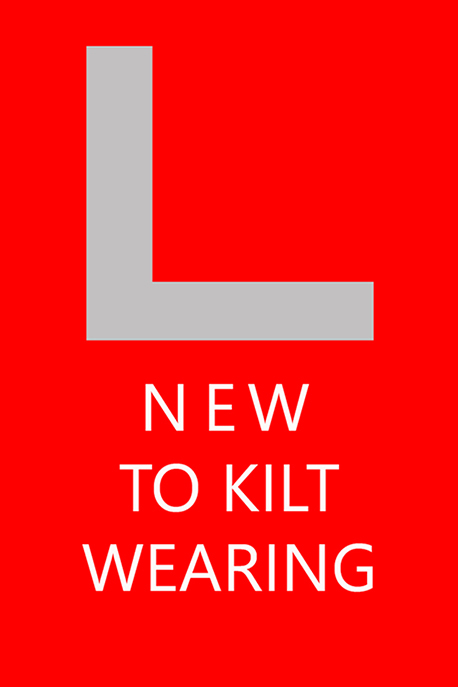 The YouGov research, refereed to earlier, indicated that some kilt wearers will wear tights and leggings under their kilts. 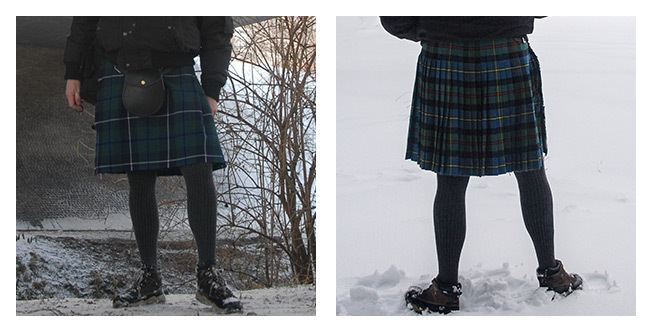 On kilt forums, where it has been discussed, some are OK with tights and leggings, others are against. But after all you can see men wearing them under shorts, so why not? They should be non-transparent of course. 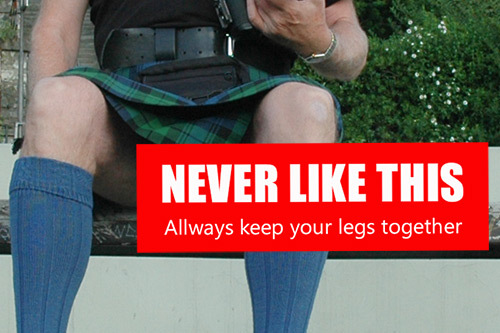 And you might consider wearing kilt hose over your tights. I do prefer kilt hose over tights and leggings. If I let go of the sporran? Colour Blue. 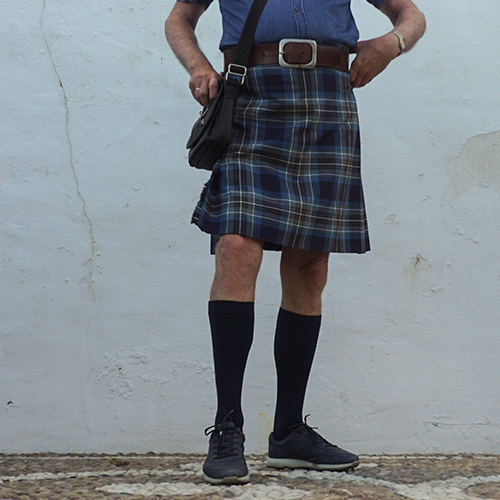 On a nice summer day wearing a blue polo, a 4 yard PV budget kilt, 10-11 oz. PV, Holyrood tartan, navy blue knee high socks, and blue sneakers. A darkbrown G-Star Raw leather belt and a shoulder bag instead of a sporran. Here we talk casual wear, not national dress. Accordingly you can and should forget about most and often rigid rules, apart from a general proper appearance. And honestly, how likely is it that you shall ever meet an “expert”? And should you, how likely do you think it is that he should be impolite enough to blame you? Wearing a kilt is something very special and to start with the feeling of being "open" and therefore vulnerable shall probably most of all make you fear exposing yourself. Whatever someone might do with this and other pictures on this page nothing shall be revealed. Don’t worry too much. An exposure would require a staircase being as steep as ladder - and that someone was climbing up directly under you – or a nasty person with a selfie stick. And in most situations there shall probably be a deep shadow under your kilt. Well, it does take more than a little breeze to really lift your kilt, but the wind should not be totally neglected. On your front the sporran will in practically all situations give you the needed protection. The back of your kilt is more problematic. Holding your hands discretely as far down your sides as possible will prevent it from being around your ears, but a strong wind might nevertheless make it go up. In most cases, however, it is just a question of a second or two before it is safe down again, hardly enough for anybody to really recognize what is under your kilt. And should somebody have a look to black briefs or the like, it is not that big deal after all. If not wearing any? Well, in liberal Western European countries, and if you obviously are not deliberately exposing yourself, hardly anybody should be too much shocked. It is a kilt. Point. If you are wearing a shoulder bag, make the strap as long as possible and have the bag cover the back of your kilt as far as it goes. By the way, how often have you seen what woman are wearing under their often very short skirts? Don’t be too concerned about wind. Living in a country where most days are windy I can say that wind is a minor problem, if any at all. One of the advantages wearing trousers is that you can sit and sit down without taking any care. With a skirted garment it is not that simple. Women seem per instinct to know how to sit in a skirt – even if they are seldom wearing one. With a kilt it is the same, but we men don’t have the instinct feeling of how to do. As you sit down, smooth the pleats of the kilt beneath you to prevent the kilt from twinkling but foremost to secure that you are sitting on the fabric, not directly on the chair. Keep your legs together or be sure to press your sporran between your legs. When sitting, keep at all times your legs together; you should never spread them. 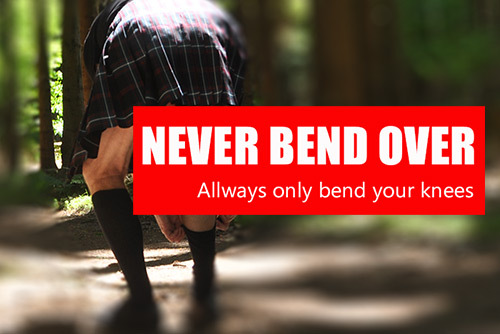 If you do, make sure the apron of your kilt is between your legs. Sitting with crossed legs is possible, but then better cross your ankles than your thighs. Especially when changing position pay a little bit attention. Come in mind that people might be focused on your legs (in restaurants, on benches in parks etc.). You have dropped something which you'll pick up or you are going to tie your shoelaces or you are about to take a product from the lowest shelf in the super market: ALWAYS bend or go down your knees and keep your back straight. Never ever just bend over! 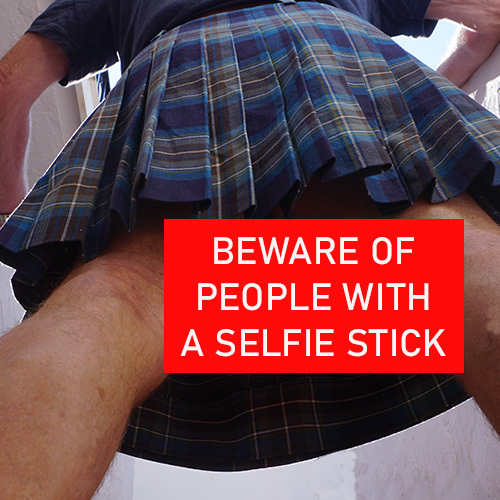 Earlier kilted soldiers could be checked for forbidden underwear by means of a mirror on a stick. Today it is possible with a smart phone on a selfie stick. Or just the phone. The problem is real. "Upskirting" as it is called has since 2010 been illegal in Scotland and so it is or is about to be in other countries as well. • If you have not yet ordered that first kilt of yours and the few accessories to go with it, do it now. • Wait for it to come. • When arrived, immediately try on the stuff. • Go outside in your kilt and feel confident about it. • Consider informing surroundings by means of social media. • Be prepared that a costly kilt addiction might have just begun!